Talk App enables you to start discussions and leave comments anywhere on Confluence pages. Especially useful for technical writers, QAs and managers. Try the plugin for free or visit our sandbox to view a demo! Add your question, comment or remark to any part of any page. 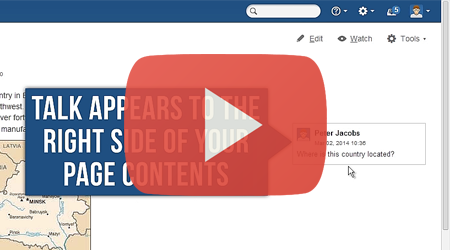 Easily navigate between discussions and add comments to them. Don't miss new answers and comments with email notifications. Start a discussion with your team by leaving a remark next to the content you want to comment. Navigate to embedded discussions by clicking their icons on Confluence pages. Join discussions without entering the edit mode. Made a typo in your comment? Edit it. Your comment is not relevant any more? Remove it. You can enter and edit your comments using the plain old wiki markup. It will be properly rendered on pages and in notifications. When a discussion is over, you can remove it with a single click. When a discussion is created, updated or resolved, every page watcher receives an email and a Workbox notifications. If the Autowatch option is enabled in your Confluence user profile, you become a watcher after adding your first reply to a discussion. How can your team use Talk? With Talk App, a technical writer can invite the team to discuss documentation designed in Confluence. If some parts of the documentation should be clarified, it's a good idea to ask an expert for help with the @Mentions function. Talk App is a great tool for reviewing and evaluating documentation. You use instant messengers to contact somebody quickly. You use email to contact everybody. You can use Talk App to contact everybody quickly. Talk App is a fast and simple way to involve your team to discussions right on Confluence pages. Those who prefer email still stay tuned with email notifications. If your team updates team statuses in Confluence, it is handy to use Talk App to add comments to certain items of the task list, not to the whole page. You can start as many discussions on a page as you want.